As part of your demolition, you should identify components that can be diverted from the landfill--to be recycled, repurposed, or deconstructed. Deconstruction is a relatively new approach to demolition that minimizes materials going to landfills. It involves removing materials by type of material and putting them aside for reuse or recycling. With rising labor costs, this method may not be as cost-efficient as traditional demolition, however it is more environmentally sound and sustainable, long-term. A routine single family dwelling might yield the following materials that are suitable for recycling or reuse. This post is one in a series. Your demolition may require submittal of a Project Notification Form to the Georgia Environmental Protection Division. If the demo involves asbestos, notification must take place prior to asbestos removal. 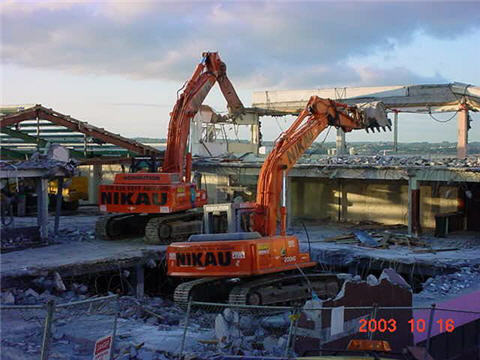 Normally, there is a ten business day waiting period required prior to handling asbestos or wrecking. Get inspected for asbestos, wells, septic tanks, rodents and other potential hazardous situations. Older homes typically include asbestos in flooring products, HVAC ductwork, shingles, pipe insulation, exterior siding and floor tiles. Asbestos becomes dangerous when it gets disturbed during a demolition. Due to the size and it’s physical characteristics, asbestos fibers may become trapped in the lungs, causing inflammation over time. This can lead to breathing problems and increase the risk of asbestosis and various types of lung cancer. Our accredited inspectors can determine if asbestos is present in your home. In planning a demolition, renovation or are suspicious of a product in your home, contact our inspectors to arrange and inspection. If asbestos does exist in a house that is scheduled for demolition, it most likely needs to be removed by a licensed asbestos abatement company. Companies like Southern Demolition and Environmental know how to minimize airborne fibers to reduce risk to you and your neighbors. In addition, measure are taken to ensure adherence to the Georgia Solid Waste Act. Many houses build before 1978 contain lead-based paint. Before demolishing a house with a septic tank, you must remove or fill the tank to avoid a health hazard. Also, you should have your house inspected for rodents prior to demolition. For each relevant entity, you must apply for a permit and provide fees and bonds, if applicable. Within the metro Atlanta area, municipalities often require having a registered surveyor or engineer prepare a site plan that indicates the building or house to be demolished, accessory structures, the septic tank (if any), trees to be removed, trees to be protected, erosion control measures and tree save fencing. Often, site plan reviewers will add notations that need to be added to the site plan for approval. Our relationships with our surveyors and engineers allow us to obtain a survey quickly and cost effectively. 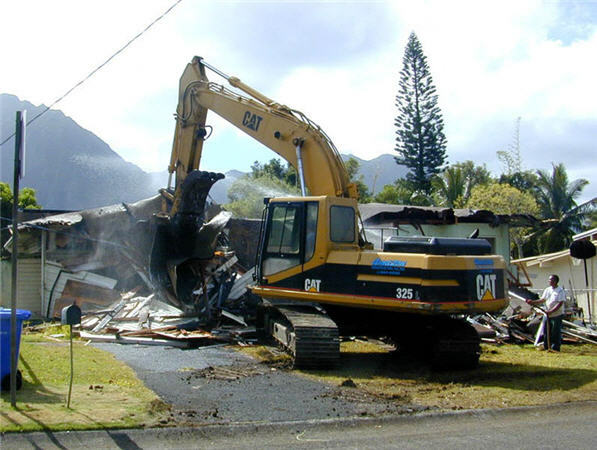 When Southern Demolition and Environmental secures a demolition permit for a homeowner, builder or investor, we act as expeditiously as possible to engage the vendors required to make submission of application as seamless as possible. Turnaround times for various permit offices vary. Some permit offices, such as Cobb County, City of Lawrenceville and Fulton County can process demolition permits in as little as one day. Other permit offices, such as City of Sandy Springs, City of East Point, DeKalb County, Athens-Clarke County and City of Atlanta can take substantially more time and have more stringent requirements relative to the demolition permit application. The City of Atlanta routes demolition applications and site plans through Site Development, in addition to the Planning Department, Arborist and Zoning (thus, the cost for demolition permit has increased). Before Nov 1st, 2009, one could get a demolition permit in one day. Now the turnaround time for approval can be as much as 10 business days - or more. It is important to submit multiple copies of site plans (nine are currently required, but have more prepared to be on the safe side). Also, be aware that the Department of Planning is not open to the public five days a week. Check with their schedule before planning to apply for the permit. They do take appointments, however, and it is recommended to make one in advance, should you seek to speak to a city planner. Research required permits and regulations. Determine if your address requires applying for a haul route. Determine if the permit will require a Demolition Site Plan to be submitted with the permit application. If your building is covered by a condo or homeowner's association, you will have to earn approval of that entity as well. Some homeowner's associations have restrictions on the hours during which demolitions may take place. Others prohibit the placement of dumpsters on site, and that means more expensive disposal on a daily basis. If your building is located in a historic district, you may require the approval of a historic preservation board. Homeowners have been fined hundreds of dollars for demolishing a house without a permit. If you hire a demolition company, you should include the demolition permit cost in your contract. Sign a written contract with an insured demolition company. Ask to see proof of any relevant insurance documents and certifications. In addition to being underwritten by a top rated insurance carrier, Southern Demolition and Environmental has earned the following certifications and licenses. The National Building Code provides guidelines for demolitions, but many local municipalities have their own code. Ensure you find a contractor familiar with local regulations. Each of these associations has its own rules and procedures. City and County demolition permits can take anywhere from one hour to one month or longer for plan review and for issuance. Some municipalities require pre and/or post inspections to finalize the permit. In addition, the EPD requires a 10 business day notification prior to demolition.